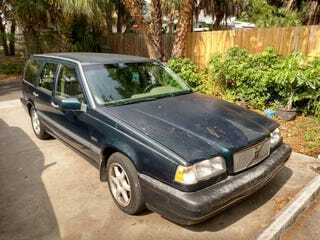 I found this 1996 Volvo 850 wagon for sale for $1000 and its essentially a mess. Unknown mileage (broken rolled back odometer), terrible interior, no AC, leaking power steering pump, bad paint, and a few blemishes. The fact that I sold my 4 year newer, lower mileage, very clean interior V70R for very little more is kinda sad. None of the door panels on the inside even exist anymore! Mine had the better stereo, a sunroof, was very clean, and ICE COLD AC and yet it sold for barely more. I spent a lot of time and money getting new headlights and bulbs which looked perfect. Also had brand new tires! No leaks either. I really hope that this doesn’t sell quickly just to make myself feel better.